Aaron Burns puts in some practise before this weekend's big final. Photo: Gary Gardiner. IN BL WK 1816-507. If there’s a first goal-scorer market for the big final, Aaron Burns mustn’t be far off top spot. The midfielder has bagged 27 goals in 43 appearances this season. That takes his Linfield totals to 71 in 209 games. His hat-trick in the semi-final saw off Lurgan Celtic. So can he cause double Lurgan heartache with another display of heroics this weekend? He knows his old mate in the Glenavon goal won’t let that happen easily. “You have to have a good strike on you to get the goal because Tuffs is tough to get past,” he said. “It’s going to have to be a good one to beat him. 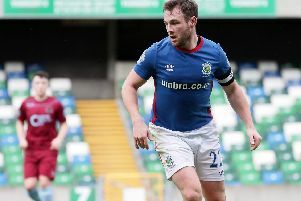 The Linfield squad have every reason to be feeling all but unbeatable at the minute. Since the turn of the year, they’ve won 17 of 21 games, losing just three and drawing once. But former Banbridge Town Juniors man Burns knows Saturday’s match will be a different kettle of fish. Since picking up a league and cup double in 2012, Linfield have won just one County Antrim Shield. Burns knows that is slim pickings for a club used to victory. And he says his boys are out to end the run in style. “It’s been a bit of a wait,” he conceded. “The fans have been very patient so fingers crossed we can bring it home for them on Saturday. “To do that, we’ll have to overcome tough opposition in Glenavon but we have full confidence that we can get the win. Burns has only got the better of Tuffey once this season, that goal from the penalty spot in the 1-1 draw earlier this year. He says practice on spot-kicks will be plentiful this week, although he wasn’t giving away any secrets with Tuffey listening in. So what about a Burns winner? “Tuffs might have something to say about that but fingers crossed,” he laughed, casting a glance in Jonny’s direction. All very diplomatic. No doubt though, that friendship will go out the window for 90 minutes at Windsor Park.